Congress is ramping up pressure on China to crack down on the shipment of the deadly, synthetic opioid fentanyl, this as President Donald Trump meets with the vice premier of China amid crucial trade talks between the two countries. 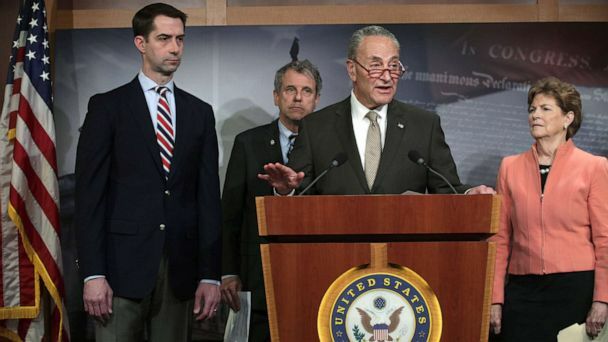 It's not often the Senate's Democratic leader teams up with one of the chamber's most conservative members, but so it was on Thursday when Senators Chuck Schumer of New York and Arkansas' Tom Cotton joined a bipartisan group of senators to introduce legislation that would slap targeted sanctions on China if it fails to live up to a recent promise to regulate fentanyl as a controlled substance. "China's pharmaceutical and chemical companies that produce legitimate pharmaceuticals knowingly divert illicit fentanyl products and precursors to traffickers and the end product finds its way into the United States," Sen. Schumslow-burning "That has to stop. The slow burning fire of fentanyl is now five alarm inferno, and we just can't keep watching as Chinese producers and China's and Mexico's traffickers pour gasoline all over that conflagration...It's high time to attack this problem at its roots." Sen. Cotton blasted the Communist nation saying "China has waged an opium war in reverse against United States for years. Chinese super labs cooked up the deadly synthetic opioid fentanyl to poison American citizens...And it's time to crack down on Chinese fentanyl." The GOP senator pointed an accusatory finger at his own party saying too many in his party see business opportunities in China, but they're ignoring what he said was the reality, adding, "They are not a partner. They are not an ally. They are an adversary on every front." The Fentanyl Sanctions Act, the first of its kind, allots $600 million to law enforcement and intelligence officials to help identify those who produce and traffic the illicit drug, requires the president to publicly identify those bad actors, and deals a major financial blow to China's major chemical and pharmaceutical companies by blocking access to U.S. markets if they are caught producing the drug. The deadly synthetic opioid, 50 to 100 times more powerful than morphine, accounted for more than 40 percent of overdose deaths in 2017, according to the National Institute on Drug Abuse, and the situation has only gotten worse as the cheap drug has continued to flow into the country primarily from China, oftentimes through Mexico. "Eleven people will die today. Eleven people will die tomorrow from opioid overdose. A huge number of those deaths will come from fentanyl and car-fentanyl," Sen. Sherrod Brown, D-Ohio, a bill co-sponsor, told reporters. "This has to stop." Schumer - who said he had talked to President Trump about the legislative push and thought there was "a very, very good chance it gets signed into law" -- likened the proposed sanctions to those imposed against bad actors who endanger U.S. national security. "There's no reason we shouldn't use those same powerful sanctions to keep us safe from another killer, the opioid epidemic," the Democratic leader said. And while earlier this week, China announced that the deadly painkiller and its many derivatives would be designated controlled substances, keeping a promise that Chinese President Xi Jingping made to President Trump at a summit in December, the senators were dubious. "Color me skeptical that the Chinese government will uphold the end of this bargain, much like they don't uphold their end of almost any other bargain they struck with the U.S. or the civilized world," Sen. Cotton said. Sen. Marco Rubio, R-Florida, also a co-sponsor of the bill, answering skeptics who say China might not have the resources and capability to mount such a massive effort to stop fentanyl, noted that the Communist nation is "pretty good at cracking down when they want to crack down," like shutting down the Internet, Christian churches, and protestors of all stripes, the senator said. "They haven't cracked down on this for one simple reason, and that is - the people who are doing this who are manufacturing this and handing it off to traffickers are making a lot of money," Rubio said. The lawmakers also called on China to agree, within the current US-China trade talks, to an aggressive enforcement plan against fentanyl.